My mother’s famous line was ” to have a friend is to be a friend.” No one could embody that statement more than Hot Harry Kirsch. All of us in the North Park Running and Cycling community lost a friend tonight when we heard the news that Hot Harry had ” run his last mile at 8:30 PM.” With his family around him, he passed quietly and peacefully. Hot Harry was an icon in the running scene in Pittsburgh. As a marine, and a retired trolley/bus driver, Harry began running in earnest in his 50s and over the course of his life he ran over 50 marathons including his beloved Marine Corps Marathon. 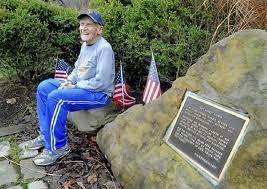 Organizing bus trips to Washington D.C for years, Harry supported the Marines by bringing hundreds of runners together to hear the Marine at the top of the hill shouting,” Pain is fleeting, pride is forever.” Harry ran countless Boston Marathons , one of which in 1987, I was fortunate enough to be his room mate. Harry was always supportive to first time marathoners with his cheery disposition and friendly ways. He encouraged veteran runners as well in advance of events and in the glow of the finish line. For years, runners who parked at Stone Field in North Park finished their runs seeing the familiar open trunk on Harry’s car filled with bottles of drinks and cups that Harry would provide not only on race days but every day of running in the park. He had a way of gathering people and generating enthusiasm and even started the first running club in the park -Hot Harry’s North Park Runners. At events nationwide, runners would often see the singlet of the club at events and inquire about Hot Harry. The North Park runners were only too happy to oblige in telling the tales of the retired bus driver who attracted so many runners to his fold. 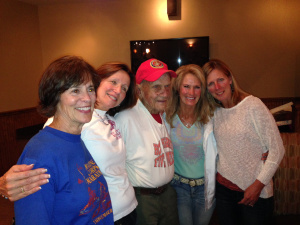 Harry loved the ladies and ran often with a group of accomplished women runners many of whom were national class. They loved Harry and made a point to run with him whenever they could. Harry also attracted the characters. Doc Chuck, Merz, and a host of others whom he named. Big nose Bill, Sad Bill, Bushy Debbie, 10 Mile Bill, the Pretty Boys,and many, many more who all claimed Harry as their fearless leader. He would invite all the runners and their families to picnics at his farm in Evans City and we all would see Harry giving the kids tractor rides tirelessly into the evening. Harry loved the Park and enjoyed every moment meeting new people and welcoming them and encouraging them to join in his community. He drank a lot of coffee. Boy did he like coffee!! Hot Harry was truly a friend to all of us in the North Park running community. He made the effort to be there for all of us and not only in the fun times of after work running and the weekend races, but there for us in sad times as well. Harry valued the friendships and made an effort to contact people who were hurting and people who were injured, sick, or just having a bad day. When you saw that smile and his familiar,” Heyyyyyyyyy” , you know that no matter what was going on in your life, Harry would make you smile and make you feel that things were better in your world. Second Corinthians 5 says that we all will abandon our earthly bodies and take on the new bodies that we will have for eternity in heaven. I believe that Harry willingly left this world and his earthly body behind, with all of its mileage and marathons, and strapped on a new pair of celestial NIKE shoes and streaked toward the finish line at the pearly gates. There he was welcomed with the statement” well done my good and faithful servant.” Thanks for everything Harry. We will miss you. This entry was posted in Aging, American Culture, Faith, Health, Inspiration, Military, outdoor activities, outdoor sports, Outdoors, Pittsburgh, Running and tagged Boston Marathon, Hot Harry's North Park Runners, Marine Corps Marathon, U.S Marine Corps. I think he was 94 Bill. Of the ways I would like to go out, that one does not sound half bad. I never knew him, but your words have done him and his life justice. Thank you for sharing your thoughts. Great post, Pat. Harry was a tough and completely carefree guy. He served in the Marines during their “Island Hopping” campaign in the Pacific. After fighting the Imperial Army in malarial jungles and on volcanic outcroppings like Iwo Jima, running 50 marathons was like a walk in the park for him. No doubt Jack. No one today can relate to that Pacific campaign. People like Harry and my Uncle Jack. Amazing individuals with such great courage and strength. Been awhile since we spoke and things are busy around here. We sold the Arvada home for $360,000 with a $5000 concession for the beat carpet. Cleared $301,000 after paying the 2 agents, minus $35,000 that I owed on the loan, etc. Prior to that was boxing, throwing out stuff we never use, tons of trash pick up for the weekly trash people for 3 weeks in a row and then the big move on Aug. 6th with a rented U-Haul truck. Yikes! My son-in-law Casey is amazing and got 2 of his friends to help us move and we stored our belongings in Parker, filled it to the brim, as we thought we were living there. Our good bikes are here at her daughter’s house where we have been staying for a week and looking after her 2 dogs while she takes her son, Cody to Mexico for a 3 day trip as a HS graduation gift. Long story short, that house we thought we were going to buy fell thru as it needed a lot of updated and the Sellers haggled us back and forth about not fixing/replacing the furnace, water heater, gas fireplace, AC and were taking most of the appliances. They didn’t accept out counter of $8,000 off price and we terminated it and Linda got her $4,000 earnest money back. At the same time, day, her daughter saw a house 2 doors down from the trashed home while showing her mother in law the bad house we almost bought, and we got a showing that night for the new one and they took our offer. It is remodeled, all appliances stay, new big frig and a pro slate pool table downstairs stays. Real hardwood floors, double pane windows, ranch-style home, beautiful flat yard and backyard a gardener’s delight with pine trees, sprinkler system, etc. for $25,000 more than the crap house that was listed for $390,000. We got it for $414,900 and Linda is paying the difference from her Mom’s inheritance minus her $5,000 earnest money. We are paying cash and NO mortgage for the rest of our lives. Address you can look up on Redfin, Zillow or the CO MLS. It is really nice with a 3-4 yr. old furnace/AC, water heater, newer roof with a 5 yr. warranty and new garage door. There is an HOA for $70/mo. with a clubhouse and pool, trash, common grounds maintenance. The bike path is right out the front door to the Cherry Creek trail system that I will have to explore and figure out. This is obviously in Parker too and not far from our storage place. A little further to WP on C-470, but………. We close tomorrow, Friday at 2:30p and say a prayer for us to finish the deal. We will be able to sell this way down the road for double they are saying with real estate in CO. I am also on Douglas County schools for subbing in special ed. as they accepted me back in July. You’re right Harry was a great friend and special breed, he was awesome! Very sad here, but glad to know he’s running again. Thanks for writing this. Thanks Art. Harry was special. Thank you Pat for telling those of us who never knew him, something about a guy who was a source of so much energy and friendship. It sure sounds like he led a fabulous life to the fullest, and lifted up a lot of people on the way. He did Edie. Wonderful guy. Sounds like how your dad was. Hot Harry, wow! Been decades since i heard that name. Thanks for sharing … kicked my muse gear into overdrive. Nice to hear from you. Check out some of the later posts. Hope all is well?